Depraved Heart begins much as the 22 novels preceding it have. Dr. Kay Scarpetta is surveying the body of a Hollywood star's daughter when her phone buzzes. The message appears to be from the private line of her niece Lucy. As an expert in all things technology, Lucy has accumulated a massive wealth and cherishes her privacy. If Lucy is reaching out through this line, then something is terribly important. If you didn't read the previous novel, Flesh and Blood, then you may be surprised to learn that a psychopathic murderer and Lucy's former love interest is out to kill Scarpetta. For those of you who did read the last book, you'll recall that Carrie Grethen, who Scarpetta believed dead, shot Kay with a harpoon gun and escaped. When Scarpetta looks at the message from Lucy, she is terrified to discover that the message is actually a link to a secret video taken of Lucy during her days as a trainee at the FBI. Two things become very clear. Carrie is behind the videos, and she is threatening the lives of Scarpetta and everyone she holds dear. The twenty-third installment in the Kay Scarpetta series corrects many of the wrongs committed in the previous novel. Flesh and Blood threw a sudden cliff hanger at readers that really sullied all of the great moments that preceded it. Thankfully, Cornwell uses Depraved Heart to begin to flesh out the implications of that ending. With all of that in mind, I highly recommend reading the previous novel before you dive into this one. Without the backstory of Carrie Grethen's resurgence, much of the plot and suspense of this novel will be unintelligible. I was gifted an autographed copy of Depraved Heart from my book-blogging friend John Valeri. My mixed reaction to the previous novel kept the book languishing on my shelf for months. Finally my curiosity got the better of me, and I decided to see the story through. Much of my complaints about the newer Scarpetta novels remain in this one. Kay Scarpetta has gone from a tough medical examiner making her way in a male dominated profession to a paranoid whiner who complains when things don't work out to her liking. The evolution of the character has made it difficult to root for her. Where the early novels relied on the action of an active investigation, Depraved Heart is mostly comprised of the suspicious inner dialogue of the main character. The action is almost non-existent. All that being said, I could not stop reading this book! I'm usually weary of an author reviving a villain from previous novels, but Carrie Grethen is a force to be reckoned with. To see the way that Scarpetta, Lucy, and Marino (Scarpetta's longtime detective partner) react to being hunted by a killer is terrifying. For all her faults as an author, nobody can deliver genuine scares and thrills like Patricia Cornwell. The climatic encounter had me holding my breath as Scarpetta faced one of the most fear-inducing scenes that I've ever read. While Depraved Heart is far from perfect, it represents an upward tick in a series that has recently languished in mediocrity. With Depraved Heart, Patricia Cornwell has found a solid footing to ground the next evolution of her decades-old series. For the first time in years, I am eagerly awaiting the next installment in the Kay Scarpetta series. 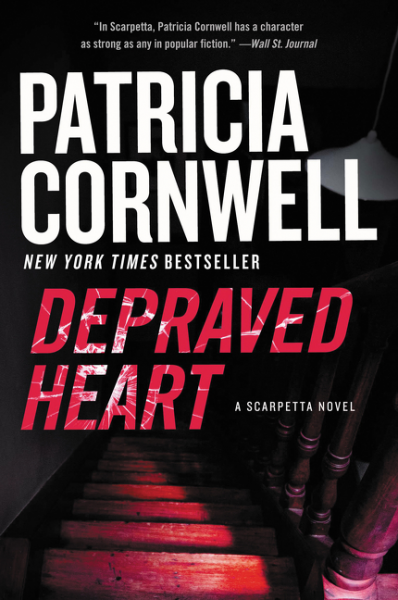 This entry was posted on Tuesday, January 31, 2017 and is filed under Book Review,Depraved Heart,Flesh and Blood,John Valeri,Kay Scarpetta,Mystery,Patricia Cornwell,Thriller. You can follow any responses to this entry through the RSS 2.0. You can leave a response. This book really gives the characters time to deal with the implications of the action in the previous novel. If you are not already invested in the story, you may have a hard time getting into this one. I'm glad to see that this book has revitalized this series for you!